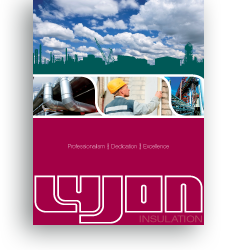 Lyjon’s Insulation divison, under the banner of Ellesmere Port Insulation (UK) Ltd, undertakes work on new installations, refurbishment and maintenance on existing plants for clients including: Tate & Lyle, United Utilities, Westway Terminals, United Storage and Exterran. To deliver customer satisfaction to the highest standards of quality and to be the preferable insulation and metalwork contractor of choice. Maintain and continually improve a ‘Quality Management System’ that meets the requirements of BSENISO 9001:2000. Establish, maintain and continually improve an ‘Occupational Health & Safety Management System’ that meets the requirements of OHSAS 18001:1999. Establish, maintain and continually improve an ‘Environmental Management System’ which meets the requirements of BS EN ISO 14001:1996. We will always consider the way we go about our business with sustainability in mind, including educating our people and local communities for effective protection of our environment, prudent use of natural resources and the maintenance of a high and stable level of economic growth and employment.